During the warmer summer months we tend to allow less time for dinner prep to allow for more time outside. This sheet pan dinner is just the ticket for a quick and healthy summer meal that uses some of those spring vegetables from the garden! Combine all seasoning ingredients in a small bowl. Divide mixture into two portions. Place chickpeas into a bowl, and toss with 1 tsp olive oil and half of the seasoning mixture. Add 1/4 tsp chipotle chili powder and toss to coat. Add chopped zucchini, red pepper, red onion, and radishes to a bowl. Add remaining 2 tsp olive oil and remainder of the seasoning mixture. Toss to coat. Line two sheet pans with parchment paper. Spread chickpeas on one pan, and vegetable mixture on another. Bake for 20 minutes, stirring each pan once halfway through cooking. While chickpeas and vegetables are roasting, prepare the creamy avocado sauce. 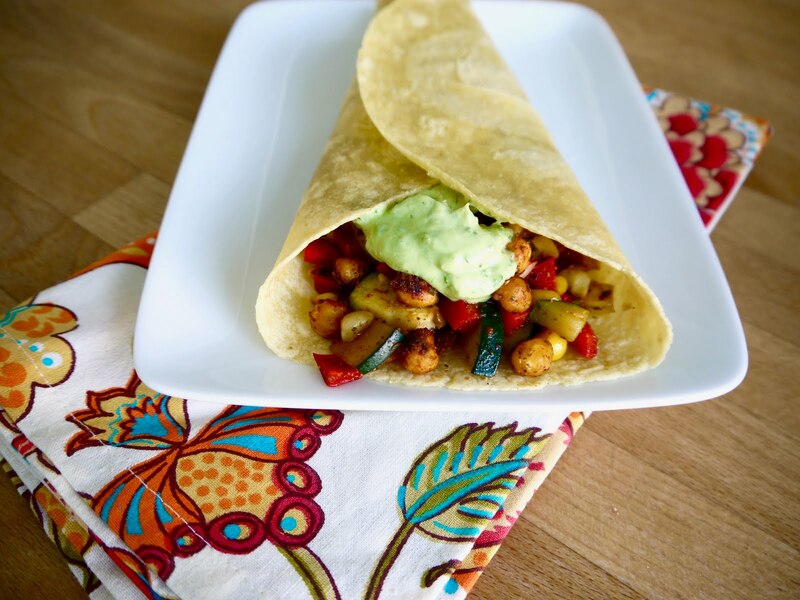 Serve each corn tortilla topped with chickpeas and vegetables, then dolloped with avocado sauce.